I have a tendency to think that when Max acts "off" in some way, it somehow relates to the brain damage. Like last night. Max had been sitting at the kitchen table watching YouTube clips from the movie Cars on his iPad (we still haven't gotten rid of YouTube, what can I say, I'm soft). Bedtime had arrived; Dave was already upstairs, reading to Sabrina. "OK, Max, time to go to sleep," I said. "Yes," I repeated, "time to go to sleep, you need to turn off the iPad." "NOOOOOO," Max repeated. "I-AAAAH!" (His word for iPad.) At which point I took away the I-AAAAH and placed it out of his reach. At which point Max started crying-screeching—and did not stop for an hour. Seriously. Even after I dragged him upstairs, put him in his pajamas as he kicked and screamed, tried to get him to lie down. He charged around our second floor, wailing and saying "I-AAAAH! I-AAAAH!" 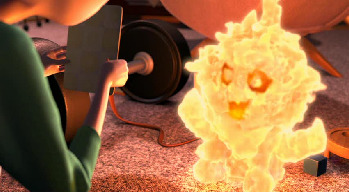 I kept picturing that scene from The Incredibles when normally sweet-tempered Jack-Jack turns into this fiery Beelzebub of a baby. Nothing Dave said or did helped, either. We both started wondering if Max was feeling OK or whether somehow, the already-wacky wiring in his head had been disturbed—seizure activity? What?—and unhinged him. He fell asleep only after I lay down next to him in our bed (like I said, I am SOFT). Cut to morning: Max wakes up with the most beatific smile on his face. Nothing wrong with him. Truth is, I realize, the night before he'd been acting like any other misbehaving little boy, mad because he hadn't gotten his way. Totally typical. And I have got to quit viewing things through special-needs glasses. Oh, do I! I tend to be soft as well. Only in the last year or so have we realized that some of Jakey's 'fits' are fits of temper. Sometimes he just wants his way and is willing to push like any other kid. We rented an iPad from WATAP.org, and Jake is also obsessed with youtube (leave it to him to find it). We decided to you the iPad as a reward in potty training. He's not potty trained, but he still looks for it in its special hiding place, drags furniture into the bathroom to climb for it, and will ask to sit on the toilet in hopes that we'll hand it over. For days, we've heard, "Wan ipah please. Is rye there-ere." Your story made me smile. I'm a softie too. I'm the same way with my non-special needs son too. Maybe it's just a Mom thing. Yes, I know exactly what you mean! Little angels can be little monsters when they want their way and don't get it! Totally. BIG newsflash: our kids can be brats too. Yep. I know exactly what you mean. The difference, however, is that a typical kid wouldn't likely rage for more than a few minutes, and would eventually accept the consequences. Speaking just for us, it's really a question of degrees. A typical kid might get frustrated but won't lift up a chair and slam it to the floor. The emotion is typical, being a brat is typical, but the coping skills aren't. Does that make sense? Our Special Powers Kid Kade has shown his ability to fake out therapists. Early on, when he did not want to partake in PT or OT, he would hold his breath until the therapist would stop. Once they stopped he was fine. We had several conversations with his Ped and Ped Neuro about this and the response was the same "he is getting his own attitude". I totally get what you're saying. T-man does that too, and we yell at him like we yell at his typical brother. T-man can behave badly just as much as JD. and sometimes that makes me happy, even if I am annoyed. Know what I mean? Oh boy, do I ever know what you mean! Special needs or not, our children are quite capable of being royal pains in the hindquarters. By the way, Monkey is coveting "Purple Max's" iPad just a bit, and loves watching the videos of him using it. This is very timely as we are struggling this week to figure out what's plain old normal bratty behavior and what is due to communication problems. Our little buddy is growling (nice word for screaming) to get attention a lot right now. He is also trying really hard to communicate. SLP thinks it is a good thing in some ways that he is making so much noise and seeming frustrated by his lack of speech because he will work harder to acquire speech, but it's making me a little crazy to figure out how to discipline with the yelling. With older kids we pushed them to say our name for attention, not yell. With little man we can't figure out if he can figure that out yet. I've been suckered so many times it's not funny. 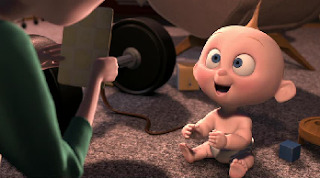 Now I'm like "Spot-A-Fake" Super Mom! But like every superhero, we all have our moments of weakness. definitely know what you mean...there are times when it is typical behavior and other times you know that it may be a special needs type issue (sensory, pain, frustration, lack of communication skills, etc). It is sometimes hard to recognize which one it is and how to react. Honestly? I blame Apple. The stinking iPhone (we don't have an iPad) turns my son into a DEMON. That is, when we take it away from him. It's almost not worth the peace we all get when he plays with it (also YouTube) when the fury comes as we take it away. In fact, we had a similar scene at bedtime last night! About the special needs and behaviors? YES. I do it all the time. It's just so easy to go there. I have to share with you that my daughter is barely three and the first thing out of her mouth every morning when she wakes is: "iPad!" I don't blame you a bit. I had to convince my ENTIRE family that my screaming toddler was, in fact, just throwing a tantrum. He was *very* easy to cure--time out!--but only everyone else stopped coddling him. Yes! Deb (and anyone else who can answer) do you know if there's any other way to rent an iPad? I'd love to know if it would work for my son without having to make the investment. Check with your state. I found WATAP.org while researching help for my son in Washington (state, not DC). You could also call them to see if they know of any programs in other states. Yes, it's so hard knowing the whys... I mean, sometime Max is totally grumpy and inconsolable when he's sick (or getting sick). But that wasn't the case this time. Like I said, I know I need to stop thinking it's always related to his special needs and overanalyzing and just deal with the situation at hand. Josh: "He is getting his own attitude" made me laugh. It is SO cool, Deb, that you were able to rent an iPad. I know that the main Cerebral Palsy Association in our state has a lending library of tech devices, though I'm not sure they have iPads yet (and I'm pretty sure they loan stuff to kids with all kinds of special needs, not just cp). Elizabeth, maybe your speech therapist has ideas? I do think it would be worth a shot to see if the school district would be up for buying one once your son has aged out of IEP, if he doesn't yet have one. I can totally relate. I find myself doing the same thing with Lillie. You are totally human. Unfortunately, Lil can't really speak yet so instead of screeching she screams. But you understand the difference between the painful cry and the "I am POed" cry. We do what it takes. So don't think you are soft! Lil loves YouTube (again not soft). Since she has CP and CVI anything to strengthen her eyes is vision therapy to me (Obviously not getting carried away). But I love our Apple TV. It has been a god send especially being able to view YouTube videos on the big screen and being able to sync them so if we find something on YouTube on the Apple TV that it will be synced with her iPad. Love technology. And thanks for sharing and making me feel human again! LOL. Thank you Deb & Ellen! I am going to put Joshua's EI to work on it! On Thanksgiving we were visiting relatives and Joshua would not take his afternoon nap. They wanted to blame it on his condition but I wouldn't have it. He is on a schedule, like most kids his age, and when that gets messed up he gets cranky. He does fine when we're on vacation but we were in a small house with a lot of noise going on and his schedule had already been messed up that day. He is very stubborn so most of the time it's his personality (which he gets honestly from both sides) showing. Oh boy, DO I know what you mean. We've finally learned that the age of 6 that many of Malayna's tantrums are "typical". I have to turn the computer off after dinner so she doesn't get back on it before bed because otherwise she's a demon when we tell her it's time to go to bed. She has an iPad but she's not as attached to that. But I too immediately think she's getting sick when she acts out alot of the time and sometimes she is. So I feel like the fool when she's not and feel like a monster when she is. It's impossible to balance!